India is an ancient and mysterious land full of wonder, but its huge size can be intimidating, and sometimes it’s difficult to know where to start. One of the most popular circuits, known as the ‘Golden Triangle Tour’ is the perfect introduction. 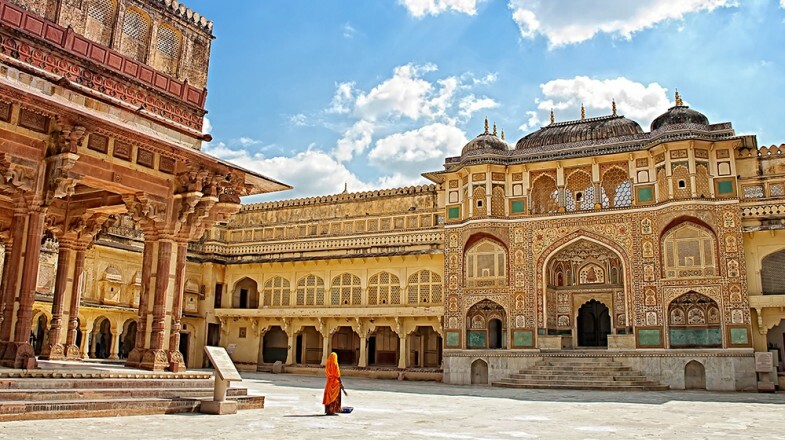 Taking in Delhi, Agra and Jaipur, the Golden Triangle tour in India offers you the chance to experience the country’s chaotic capital, see the regal Rajasthani Pink City and visit the exquisite Taj Mahal. If you visit only one monument in Delhi during the Golden Triangle trip, it should be the Red Fort. Also known as Lal Qila and located in the raucous streets of Old Delhi, the former seat of the Moghul rulers shouldn’t be missed. Delhi is home to Akshardham Temple, a vast religious complex with claims on being the world’s largest comprehensive Hindu temple. It is also one of the most visited tourist attractions in the world and almost every visitor to Delhi makes the trip to see it. For those hoping to escape the heat, dust and disorder of the Indian capital, the tranquil oasis of Lodi Garden provides a welcome respite. Jaipur’s most recognisable sight is Hawa Mahal, the ‘Palace of Winds’. This icon of the city, now no more than the façade, was created to allow court women to observe the streets below while remaining hidden away indoors. One of Jaipur’s most unique attractions is Jantar Mantar, a medieval observatory with a fascinating collection of instruments designed for watching and charting the skies. The Pink City is not only known for its monuments — it is also home to what are reputably some of Asia’s most vibrant bazaars, and every itinerary should include a visit. Simply India’s most famous and recognisable building, the Taj Mahal is perhaps the highlight of the whole Golden Triangle tour India — despite the crowds. Agra has more to offer than just one building, and those visiting the city should also take the time to check out the imposing Agra Fort. There’s no need to be neurotic about food and drink but always use common sense. Always drink bottled water and don’t eat street food that has obviously been sitting around outside for long periods. If you have time, include an extra day to visit Fatehpur Sikri on a day trip from Agra. This evocative former imperial capital is well worth making the effort to see. While some upmarket hotels and restaurants might accept cards, cash is used for most daily transactions in India. The local currency is the Indian rupee. Many Indian cities that attract foreign tourists also have large numbers of touts, freelance tour guides and others who are generally intent on separating you from your money in various ways — and this is especially the case in Agra. Always be polite but firm when telling people you don’t require their services. Any signs that you are wavering will only see them try harder. Distances between the three cities are roughly equal or around 200 – 250km for each leg. The easiest way to travel is by train, of which there are many departures each day. Other options are to join a tour, take a bus or even to hire a private driver — not necessarily a particularly expensive option in India. The right amount of time to do the Golden Triangle tour would be about ten days. Less than this would mean you have to rush — but a few extra days would allow you to explore the cities in more depth. When heading out, make sure you dress modestly. This is true anywhere in India, but on the Golden Triangle Tour, you are likely to be visiting temples or other sacred places, where wearing the correct attire isn’t necessarily a rule, but will be much appreciated.